Home › Home and Kitchen › Grocery Art Silicone Burger Press | #1 Hamburger Press For Preparing & Storag.. Grocery Art Silicone Burger Press | #1 Hamburger Press For Preparing & Storag.. EASY-TO-USE SILICONE BURGER PRESS - Making burgers have never been easier, and it has made making stuffed burgers mindless. 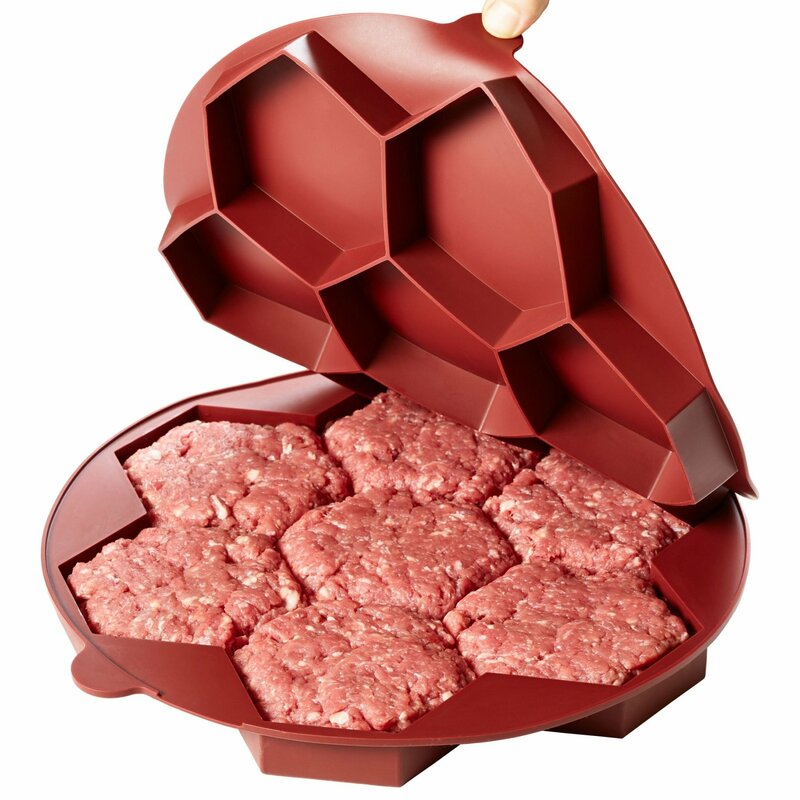 MULTIPURPOSE BURGER MOLD - Can be used to portion out a lot of stuff, not just hamburgers. Just make your mix, put it in, and press! FREEZER-FRIENDLY BURGER MAKER - For your convenience, our hamburger press can be placed in the fridge or the freezer to store it until you are ready to put it on the stove, grill or BBQ. STORES UP TO 7 LARGE BURGERS - Unlike those single hamburger makers that take up room in your fridge and freezer, this one has the capacity for 7 burger patties. HIGH-QUALITY PATTY MAKER - Our hamburger patty makers are made out of an FDA-approved food grade silicone that is 100% BPA-FREE, NON-TOXIC & DURABLE. Each of the burger makers is backed by our SATISFACTION GUARANTEE, so order risk-free now! Are you a fan of burger night? If so, you better get ready because you areabout to discover your new kitchen companion. Meet our Silicone Burger Press.Made out of an ultra durable food grade silicone that is naturally non-stick,approved by the FDA and 100% BPA-free, these hamburger patty makers by GroceryArt are incredibly safe for your entire family and extremely easy to use. Theburger mold makes 7 hamburger patties, each measuring 4.5â€ in diameter x 1â€thick. We have designed the size of our burger press according to therecommendations of professional chefs in order to deliver the perfect burgerpatties for grilling or cooking. While it produces plump burger patties, thissilicone mold can also be used to whip up baked goodies such as cookies or tocook hash browns and cutlets. Unlike other burger molds, this burger maker cansafely be stored in the refrigerator, freezer or cooler, allowing you to useit to do a little meal planning or use it for camping trips, backyard BBQs andmore. Why choose our honeycomb burger mold? - It is conveniently dishwasher-safe. - It is completely BPA-free & non-toxic. - It can be stored in thefreezer or fridge. - It makes a fabulous gift idea for burger lovers and grillmasters. Well, what could you possibly be waiting for? It's time to add aGrocery Art Silicone Burger Press to your collection of cooking essentials.Click 'ADD TO CART' to order your own stuffed burger press now! Place yourpurchase with confidence knowing that your new hamburger press is backed byour hassle-free satisfaction guarantee. If you don't absolutely love ourburger maker, simply return it and we will issue you a full refund.